USGS scientists use tracking/telemetry tags to determine the occurrence and local movement patterns of wildlife. Because energy development often takes place in critical wildlife habitats, scientists can study these wildlife patterns to help guide project siting and operational decisions to areas and practices that present the lowest risk to energy development and wildlife. USGS scientists build broadly applicable management support tools to assist resource managers and the industry in siting of energy development and selection of off-site mitigation areas. Conservation planning tools, such as those listed below, have been developed by USGS scientists to assist resource managers in prioritizing areas for future energy development. USGS scientists conduct a combination of short- and longterm biological research, survey and monitoring, data analysis and applications, new tool and technology development and application, decision support, and adaptive management to address energy and wildlife management issues. USGS scientists are testing bird and bat deterrent devices (such as ultrasonic acoustic deterrents) as well as operational management strategies that can cost-effectively reduce wildlife fatalities while allowing wind operators to generate this carbon-free energy. USGS assists state fish and wildlife agencies, land and wildlife managers, and other stakeholders by producing applied science-based tools to guide wind and solar energy development to locations where it will have minimal impact on wildlife. As a basis for these tools, USGS researchers study the movement and migration of wildlife. 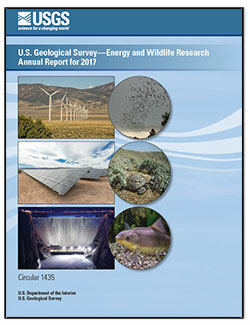 Khalil, Mona, ed., 2017, U.S. Geological Survey—Energy and wildlife research annual report for 2017: U.S. Geological Survey Circular 1435, 91 p., https://doi.org/10.3133/cir1435. 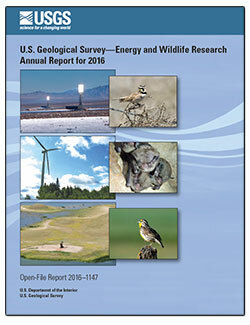 Khalil, Mona, ed., 2016, U.S. Geological Survey—Energy and Wildlife Research Annual Report for 2016: U.S. Geological Survey Open-File Report 2016–1147, 59 p., http://dx.doi.org/10.3133/ofr20161147. 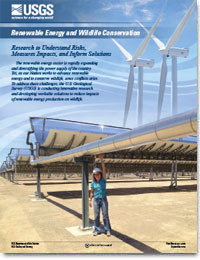 Khalil, Mona, 2016, Renewable energy and wildlife conservation: U.S. Geological Survey Fact Sheet 2016-3067, 4 p., http://dx.doi.org/10.3133/fs20163067.